So I had that recolor of the GB2016 cast that had them in uniforms looking closer to the ones in the 1984 and 1989 movies, right? Did anyone who knows me think I'd leave it at that, and not try something a little more colorful? Erin is Abby's old friend but something of a skeptic at first. I went with Venkman (though as the physics genius Egon could have worked just as well). 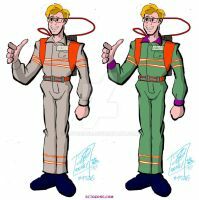 Jillian Holtzmann looks too much like Egon to not get his colors, though as the enthusiastic tinkerer I could have easily justified Ray's as well. By the way, I watched the film and liked it a lot. Haven't made it yet, but hope to soon. A friend of mine wants to go, and her birthday's next week. This may be a factor. I hope they don't plan on making an animated series after the film. It was just announced that there will a show called "Ghostbusters: Ecto Force" in 2018. It apparently takes place in 2050 and they haven't said for sure whether it will be in the original movie continuity, the new movie continuity, or will have RGB or EGB in continuity. But it apparently won't star the 2016 characters either way, it would appear. NO joke! I thought of "Ghostbusters: Ecto Force" years ago. Talk about spooky. Hmm, quite really good. I know a friend who could like this. He liked the original cartoon.